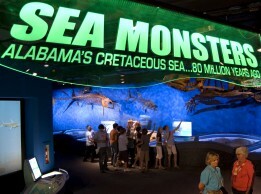 Rising from the depths after 80 million years, meet the faces and fins that once swam the ancient oceans of Alabama. In this exhibit visitors will come face-to-face with a 15-foot sea turtle, a 17-foot fish chasing its prey and visitors will peer into the jaws of the most dangerous sea monster of its time – the Mosasaur. This specimen was the largest carnivorous fish of it’s day. This specimen is 17 feet long and known for its long, sharp teeth! This giant’s name means “first roof”. Protostega’s common name is “Sea Turtle” and it is 15.5 feet from flipper to flipper and 13 feet from head to tail. This specimen’s name means “thick rooted tooth”, stretched 6 feet long from teeth to tail! This specimen’s name means “one who locks” is also known as the “Greene County Mosasaur”. It is 11 feet long and was the most dangerous sea monster of his time.